Releasing outer membrane vesicles or OMVs of by bacteria can be considered one of their protein secretion pathways. This pathway is especially important for carrying messages to longer distances than what other mechanisms such as type III secretion system can do. Although the gut is largely colonized, there is not much of direct cell to cell contact between the microbiota and the host cells due to presence of a thick mucosal layer and other factors. In a recent study, Shen et al. show that bacterial OMVs can make up for this distance and allow for communication between the microbiota and host. 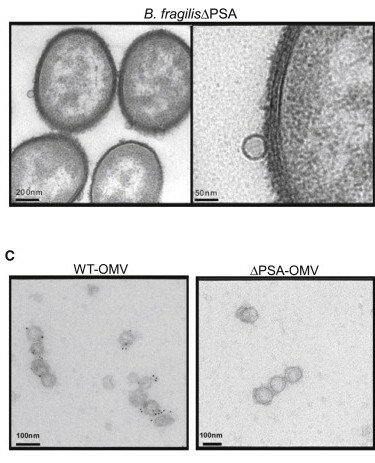 They show that orally administered OMVs collected from Bacteroides fragilis can protect mice from chemically induced colitis. Furthermore, they show that this protection is dependent on presence of a capsular polysaccharide (PSA) on the OMV surface. Shen et al. suggest that PSA-containing OMVs are picked up by dendritic cells and induce IL-10 production, thus ameliorating colitis. Specifically, they show that production of IL-10 by DCs is dependent on recognition of PSA by TLR2. Therefore, stimulation of TLR2 by B. fragilis OMVs leads to tolerance instead of inflammation, which is necessary for homeostatic maintenance of the gut.